All students want to be part of the classroom community, and there are some simple ways to make English language learners feel included. While the term English language learner (ELL) groups students together based on their level of English acquisition, these students acclimate to our classrooms in a multitude of ways. This was readily apparent to me (Serena) on my first day substituting in a fifth-grade classroom with several ELL students, three of whom stood out for how different they were from each other. One student was extremely engaged—he volunteered to read, announcing his excitement to practice his English. The second sat in the back of the classroom, keeping to herself—although she opened her book and seemed to follow along, I couldn’t draw her into active participation. The third, meanwhile, wouldn’t stay in his seat or even open his book, and when I redirected him, he looked at me blankly while another student translated for him, before reverting to misbehavior. I was unable to help him and ended up needing to call the principal for support. Instead of feeling comfortable and receptive to learning, he may have felt that he was simply being controlled. All students, regardless of their language skills or behaviors, want to feel safe in the classroom. Along with everyday obstacles, ELL students must confront the changes of a new environment. They may feel ostracized for their otherness and may not trust that a teacher wants to help. However, teachers can build successful connections with ELL students. 1. Find out about students’ backgrounds, cultures, and customs: Becoming familiar with students’ cultural heritage and norms will assist you in fostering mutual understanding. Recognizing cultural differences in behavior and reacting to them appropriately will enable you to ease students’ transitions to their new school and environment. One great way to learn more about your students is to ask them and their parents questions such as, “Do you come from a big city or small town?” and “What holidays do you celebrate?” The answers will help you to get a better grasp of your ELL students’ backgrounds. Knowing the answers to such questions are important for building engaging lessons. When teachers include literature by writers and concerning topics relating to ELL students’ cultural backgrounds, students can see themselves in classroom materials. And this introduces other students to their new peers’ cultures, which creates a more comfortable and welcoming classroom environment. 2. Assign an ELL peer to mentor new students during their transitions: Linking a new student with a classmate who has successfully acculturated can help develop student relationships and familiarize the student with their new school surroundings. Multiple studies have determined that ELL mentor/mentee relationships result in increased mentee confidence with speaking and communicating in English, as well as in improved academic performance. This mentorship can take various forms: Mentors and mentees might join a club or sport, play together after school, or study a particular subject together. The new student can lean on their mentor by asking for clarification in their native language (with the understanding that this support must lessen over time). And the mentor can invite the new student to engage with others, perhaps in a game during recess or a physical education class. 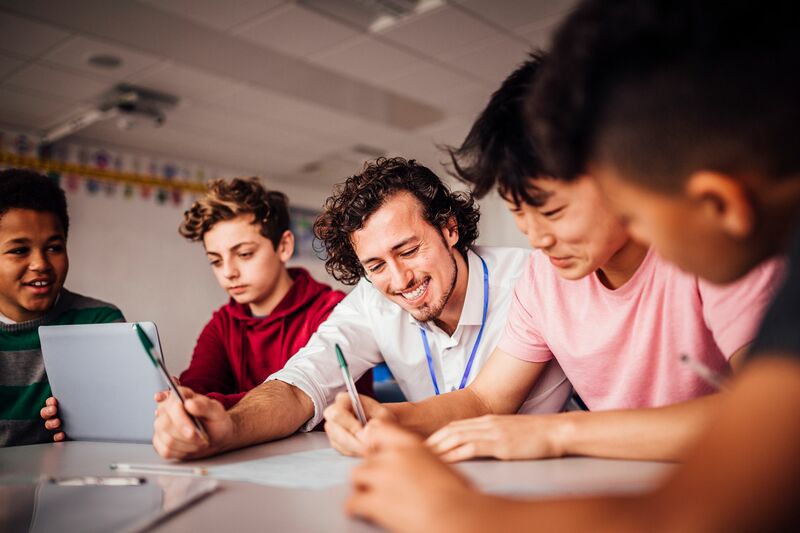 In each of these scenarios, the new ELL students socially interact with a peer with whom they can identify and potentially develop a friendship, which also leads to connections with other classmates. Both mentors and mentees have reported feelings of trust and belonging through these partnerships. 3. Encourage parental involvement: Despite wanting their children to succeed, many ELL parents feel nervous about participating in the education process due to language barriers. However, there are ways to help them feel more comfortable. If there's a language barrier, translating letters sent home and having translators present at parent-teacher conferences can help families feel included. Additionally, educating parents on the ins and outs of the U.S. school system significantly improves their understanding of teacher/school expectations, procedures, and curricula. Arranging a home visit is a great way to communicate with ELL families since some ELL students come from cultures or backgrounds that don’t use phones or email. When working with these families, it’s important to keep their cultural values in mind so that you don’t accidentally offend them. For example, you may give the thumbs-up to parents who have done a good job enforcing a regular homework schedule at home—without realizing that many people in Greece, Russia, and Latin America view this gesture as equivalent to the middle finger. When interacting with immigrant families, aim to be as culturally responsive and respectful as possible. Multicultural Manners, by Norine Dresser, is a fabulous book about different interpretations of everyday socially acceptable actions that may be viewed differently by ELL families. In the same vein, Derald Wing Sue’s Race Talk and the Conspiracy of Silence provides helpful scenarios and reflective questions for understanding and meaningfully interacting with people of diverse backgrounds. Overall, putting forth a little extra effort can positively influence ELL students’ progress as well as their relationships with, and at, their new school. Before teachers can expect full participation from ELL students, they must foster a sense of safety and security within the classroom environment. Creating this type of positive atmosphere results in lower stress levels and higher student engagement—which is beneficial for everyone.